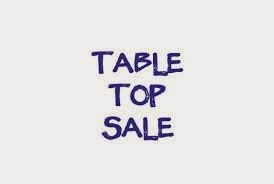 Rishton Free Gardeners Club will be holding a tabletop sale on Sunday 6th April 2014 from 10.00am until 2.00pm. Anyone can book a stall and pitches are available for £5 each both upstairs and downstairs to sell any unwanted items and bric-a-brac. Several pitches have now been booked and space is limited so to reserve a place please contact Ken on 07789077816 or Laura on 07984154412.